April fool, reason to quit the art world or symptom of Donald Trump’s dystopian vision? Such were the more printable responses elicited by the news that a painting by KAWS riffing on The Simpsons, riffing on The Beatles had sold 15 times over estimate for a record $14.8m at Sotheby’s in Hong Kong on Monday. To put things in perspective, that’s the same price as a castle in upstate New York, 30 million Cadbury’s creme eggs, or one and a bit paintings by Jenny Saville, who holds the record for the most expensive female living artist at auction. Ever. As if that wasn’t mind-bogglingly absurd enough, the 25-year-old singer Justin Bieber posted a picture of the KAWS work on Instagram after the sale, prompting speculation he was the buyer. Two wrongs most certainly do not make a right. Aside from the outrageous sum of money being handed over by someone whose idea of a real April fool is to fake his wife’s pregnancy, let’s look at the real issue at stake: the sheer conceptual bankruptcy of KAWS’s work. Sotheby’s catalogue toe-curlingly describes The Kaws Album as “the most accomplished work on canvas that KAWS [aka Brian Donnelly] ever created”. 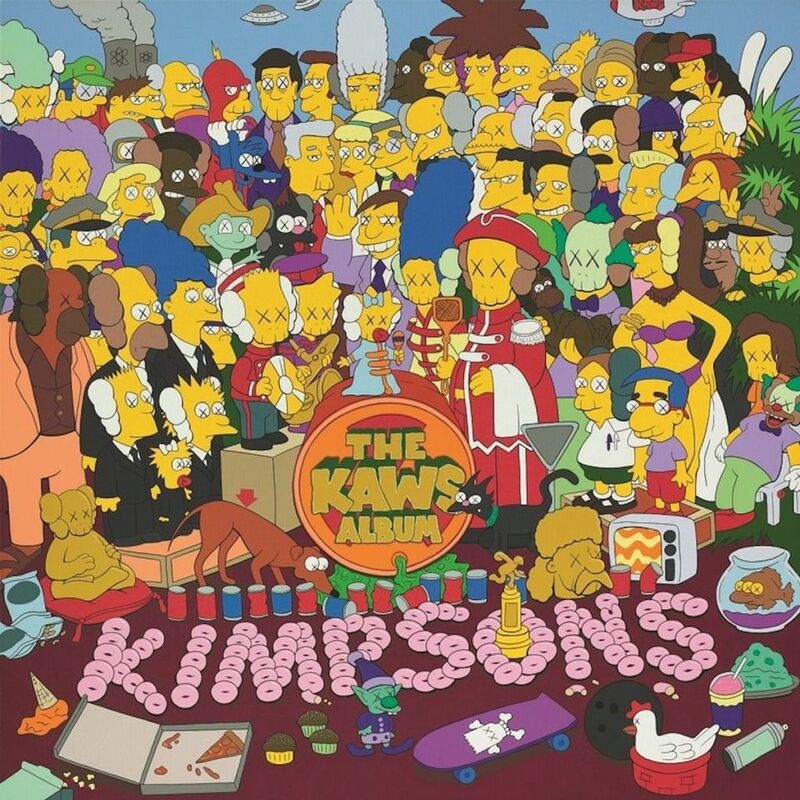 The painting, supposedly a lesson in witty and subversive appropriation, sees KAWS take The Yellow Album, The Simpson’s recreation of The Beatles’ album cover for Sgt. Pepper’s Lonely Hearts Club Band, replacing the custard yellow cartoon characters with his own “Kimpsons” characters, all with crosses for eyes. Not in their most LSD-addled nightmares would The Beatles have envisaged it would come to this. I will readily admit, I rather like KAWS’s early “ad disruptions”, when he would venture out onto the streets of New York City at night, crank open bus shelter advertising casings and remove the posters inside, painting cartoonish faces over the models with crosses for eyes before returning the posters before dawn. The crux is, he has never really moved on from this. The vast bulk of his work consists of cartoon figures with crosses for eyes–Snoopy, Mickey Mouse, the Cookie Monster have all been sullied by the same treatment. KAWS’s collectibles have boosted his cult following in Asia, but they should not be considered art. Marcel Duchamp, Andy Warhol, Sherrie Levine, Sarah Lucas. These are the artists who waged war on elitist, bourgeois models of aesthetic and conceptual value. KAWS does not belong to this lineage, despite protestations from his public relations team that The Art Newspaper drop the “street” from “street artist” when describing him. It seems an exercise in rebranding is well underway. Ever modest, KAWS conceded on Instagram that the market had lost its mind after his record sale. “Do I think my work should sell for this much? No. Did I arrive at my studio this morning the same time I always do? Yes. Will I do the same time tomorrow? Yes.” And therein lies the problem: rinse, repeat ad infinitum. After all, there’s one billionaire born every minute.